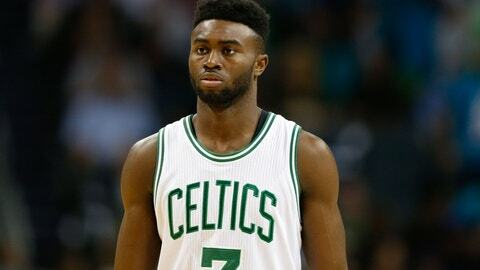 The Celtics dedicated the third overall pick to Jaylen Brown. Now, they need to carve out a larger spot in the rotation for him. The only manner in which a player entering the NBA can become accustomed to the breakneck pace of professional basketball is to be thrown into the fire. The NBA is not like the NFL, where a quarterback such as Aaron Rodgers can be groomed by spending three years sitting on the sidelines backing up a Hall of Fame talent such as Brett Favre. Getting used to the physicality of the pro game requires receiving the opportunity to be embarrassed by the incredible athletic prowess that NBA players bring to the table. Receiving the opportunity for failure only builds confidence for young players in the league. For Boston Celtics rookie small forward Jaylen Brown, these learning moments have certainly been present. We can point to when Brown’s transition layup attempt in the second quarter of Friday night’s 117-112 loss to the Thunder was rejected to Cambridge by seasoned swingman Andre Roberson as an example. However, head coach Brad Stevens is not handing Brown the amount of opportunities to commit miscues and subsequently learn from them as he deserves. While the slim margin for error that the Celtics have while battling for an upper-tier postseason seed in the crowded Eastern Conference standings it’s obvious, the team needs to dedicate a surplus of minutes in order to breed their prized draft pick into a suitable NBA rotation player. We have seen a lack of chances hamper the development of high Boston draft picks in the past, such as the stagnant improvement of shooting guard James Young through his first three seasons in the league. It is up to Stevens to ensure that Brown is not plagued by being forced to learn from the bench. So far, Brown has done far too much sitting and an underwhelming amount of performing. He has received just 14 minutes of playing time per game this season, including a combined 17 points in victories over the Hornets and the Heat a weekend ago. Brown received very little time to make an impact on the Celtics come-from-behind overtime win over the Grizzlies on Tuesday night, playing just 11 minutes, and his time was limited to 13 minutes against the Thunder. The five points that Brown racked up against the Thunder was his highest total in five games, underlining the lack of playing time that he has suffered through. Brown’s deficit in opportunity does not stem from a dearth of production. His per 36-minute averages of 13.4 points and 4.9 rebounds to accompany a 47.1 percent shooting mark from two-point range are respectable. Rather, his scarcity of minutes results from him not having yet earned the trust of Stevens. Stevens tends to tailor exclusive minutes to those who manage garner his faith. However, in the case of a rookie, a head coach must allow the first-year player time to establish himself in a rotation and prove himself worthy of commanding this respect. Rookies need time to develop in order to showcase their full potential. While Brown is able to give us short bursts of his talents by taking a steal coast-to-coast for a breathtaking dunk, it will take commitment from Stevens to his maturation as a player for him to fully bloom into the starting option that Boston fans expected him to become when the team passed on more established prospects such as Kris Dunn and Jamal Murray to select him. Considering the risk that the Celtics took in choosing a project such as Brown, it is troubling to witness Stevens’ lack of adherence to allowing him to enhance his skills in the flow of a game. Currently, Brown tends to receive the bulk of his minutes with the second team in the second quarter before sitting for much of the third quarter until the final stanza. Even though he usually breaks into action in the fourth quarter, the writing is on the wall for his return to the sidelines once the halfway point of the final 12 minutes approaches or earlier depending on the situation of the game. Brown sits on the bench for the majority of the contest seeing his minutes stripped by the likes of Jonas Jerebko (17.1 minutes per game), Kelly Olynyk (20.7 minutes), and Tyler Zeller (12.4 minutes). Meanwhile, Jerebko averages just 9.7 points per 36 minutes while his PER is just 0.5 above Brown’s. In that same time period, Olynyk averages just 0.2 points more than Brown, shoots the same percentage as Brown (43 percent), and turns the ball over an average of 2.2 times while Brown coughs it up on just 1.6 occasions. If the Celtics are devoted to molding Brown into a potential franchise cornerstone and not simply the trade bait that his third overall selection would command, Brown’s minutes should see an uptick in the near future. When Stevens opted for a Brown-Marcus Smart–Jae Crowder combination in the second quarter against the Pacers on Thursday night, the team turned the tides on what had been a porous start to the game by the starting lineup. This trio provides the athleticism on the defensive end that opposing offenses simply cannot contend with, and Stevens should utilize this lineup to push Brown’s minutes to new heights.